Interiors For Mr. Manoj in Electronic city. Have a look at our recently completed project for Mr. Manoj at Gm E-City Town Electronic City Bangalore. Interior Designers in Electronic City. Completed Interior project for Mr.Manoj in GM E-City Town Electronic City Bangalore. About Our Custom Interior work Completed in Electronic city. 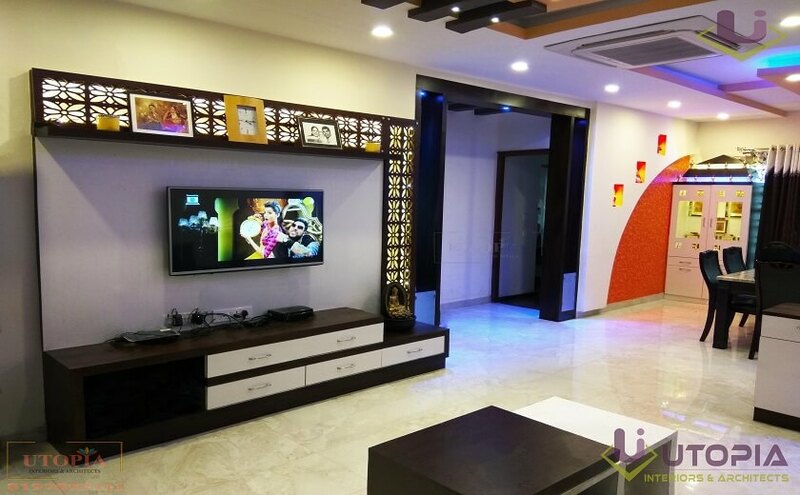 Utopia , One of the best Interior designers in electronic city provides complete interiors for your dream home.This work for Mr. Manoj at GM E-CITY in Electronic city in Bangalore added one more project to Our Portfolio. Designing homes comes with a completely different challenge . At the designing stage our experienced interior designers first try to understand as well as visualize how the designs will come through their eye. Designing is not only about arranging important furniture and accessories within the space available but also creating a alluring theme according to clients taste. After the initial discussion designers will come with the plan and create the 3D presentations of the project so that client can have clear understanding how their home will look like and also can make all decisive changes in advance. When Designs are Finalized our experienced Site Engineers make 100% sure that all the plans are executed with the correct measurements, great finish and on time delivery of the project. Completed Interior project for Mr.Manoj in GM E-City Town Electronic city.